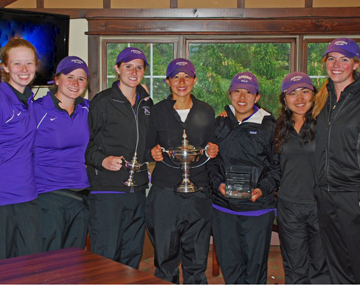 The women's golf team won back-to-back tournaments last spring, capturing the Vassar Invitational and the Jack Leaman Championship (pictured above). The team came together in the final two events of the spring, most notably earning perhaps the biggest victory in program history by defeating Williams and Wesleyan to bring the Little Three Championship back to Amherst. The win broke Williams’ streak of 14 consecutive Little Three titles, making it especially sweet for the Jeffs. As an encore, Amherst had a successful showing at the Williams Spring Invitational to end the season, finishing third of six teams. Koh led the way for the Jeffs, earning third place in a field of over 40 golfers. Koh and Moser should continue to lead the Jeffs into this season, and the development of the current players will be supplemented by the addition of first year James Line. If Koh and company can continue to build on the spring, a strong fall season is in store for the Jeffs. The women’s team enjoyed even better results than their male counterparts last season, finishing in the top three of every tournament they played. Despite the absence of top players Liz Monty ’13 and Irene Hickey ’13, both of whom were abroad in the fall, the team earned two third place finishes and a second place finish. This year’s team will miss the contributions of departing graduates Laura Monty ’12, Nina Yoo ’12 and Elaine Lin ’12, who helped to keep the ship afloat during the difficult fall without Hickey and Liz Monty. This year, Hickey and Liz Monty will captain a young team that features four first years, a pair of sophomores, and one junior in addition to the two senior captains. While the captains have the talent to lead the team effectively, the Jeffs will need their young players to learn the ropes of the college golf landscape quickly if the team intends to maintain its spot near the top of the NESCAC.